Did you know that board games have their own Olympics? Every year in London, the Mind Sports Olympiad (MSO) is held, with competitions showcasing over 60 boardgames and associated activities. 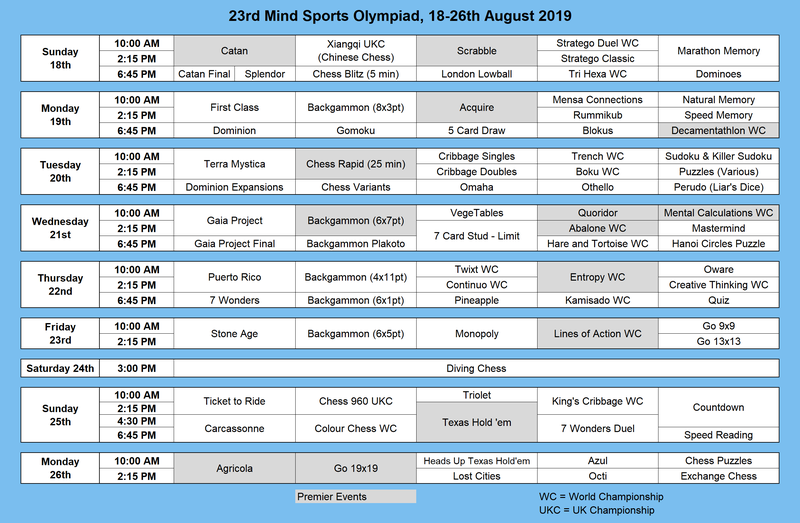 Join The Library Pot team to practice some of these great games and maybe, just maybe, enter one or two of the competitive events at the Olympiad. We will hold MSO sessions focussing on just one or two games at a time. Here is a list of the games that we will be learning and playing. We will have prearranged days for specific events, but will happily concentrate on whichever games you want to prepare for. Come to The Library Pot at 2.00pm on Friday afternoons or 7.00 pm on Tuesday evenings (no cover charge, just £10 minimum spend on food and drinks). Tuesday evening sessions start at 7.00pm. Friday afternoon sessions (and the Thursday afternoon session) at 2.00pm. These games are all available at The Library Pot if you want to come in and play at other times. If you are interested in playing any of the other event games at The Library Pot, then please contact rob or Emily.